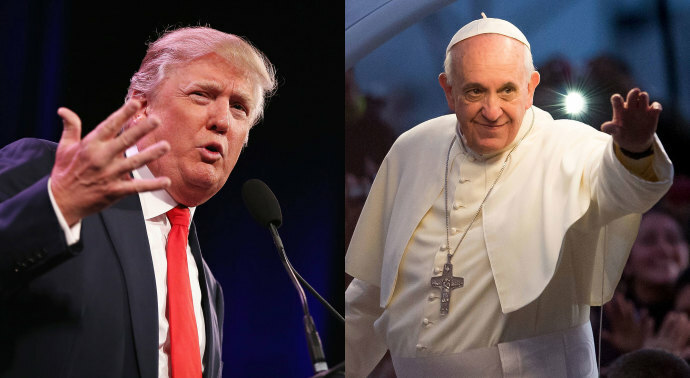 The Republican Presidential Candidate Donald Trump recently criticized Catholic Pope Francis' visit to Mexico. Donald J. Trump has a message for Pope Francis ahead of the pope’s trip to pray with migrants along the Mexican border: You don’t get it. The pope is planning to go to the Rio Grande next week while on a visit to Mexico. He plans to offer prayer and show solidarity with suffering refugees. Mr. Trump does not approve. In an interview with the Fox Business Network on Thursday, the Republican presidential candidate, who has proposed building a wall along the United States’s southern border, suggested that Francis was serving as a pawn of the Mexican government. “I think that the pope is a very political person,” Mr. Trump said." Pope Francis enjoyed a 90% favorability rating among U.S. Catholics. In addition, Francis now is rated favorably by 70% of all Americans, up from 57% in March 2013. Francis is popular even among those without a religious affiliation. Fully two-thirds of religious “nones” (68%) in the most recent Pew Research poll say they view the current pontiff favorably, up from just 39% in March 2013. According to the Pew Forum, 69 percent of Catholic Democrats say that Clinton would be a great/good president. Only 46 percent say the same thing about Bernie Sanders. So why is Donald Trump eager to take Pope Francis head on? It could be due to his culture of support that anti-immigrant nativist groups associated with the Tanton Network are giving him. Tanton's criticism of religious groups wasn't limited to Jews, over the years, he — like some principals of FAIR — lashed out at a variety of religious denominations, especially Catholics, for their welcoming attitude toward immigrants coming to America from the Third World. While Trump opines about how political the Pope is, one can certainly make the same argument of Jesus Christ the Son of God.